I mentioned a while back that we joined our local CSA this year. We’re coming up on our third week and it’s already been a joy. Our first distribution consisted of spinach, arugula, turnips, broccoli rabe, salad greens, and bok choy. My dad and his girlfriend were in town that week (thus my absence here) and I was able to introduce them both to arugula for the first time. Now, I don’t think of arugula as being anything out of the ordinary. I’ve known the spicy, peppery leaves for such a long time that I was slightly surprised when I needed to remind my dad of the name on more than a handful of occasions. It was interesting, though, to watch someone experience something completely unfamiliar, with no preconceptions. As I was washing it up to prepare a salad, I handed my dad a leaf. “What does it taste like to you?” I asked him. I slipped one between my teeth. He was right. Peanuts. I’d likely have never noticed, but there was a definite peanutty note in there. He’d never heard any of the classic adjectives associated with this “rocket” green, and it was fascinating to me that this was the very first thing that came to his mind. I tossed the arugula together with a homemade sweet balsamic vinaigrette and some sliced strawberries–more unfamiliar ground for my dad. He couldn’t stop talking about that salad for the rest of their stay. It’s so much fun to introduce people to new things, things that they’d have likely passed over in the grocery store or on a menu at a restaurant. It’s fun to be the one trying new things too. This is one of the things that I love most about being part of a CSA and I know this will only continue to build as the season progresses. Another thing I love about being part of a CSA is that I don’t have to make any decisions. You get what’s fresh and ripe, and that’s that. As much as I love the greenmarket, sometimes it can be a tad overwhelming for me. I find myself lost among the dozens of seasonal gems, all of them looking inviting, all of them seeming delicious. I want to grab some of each, but too often find myself stumped in the moment as to what I’ll do with them. I try to take mental inventory of what we have in the pantry at home, try to write recipes in my head as I simultaneously dodge the other, more purposeful shoppers. I’m a kid in a candy store when I go, and disorganized to boot. Sure, the greenmarket still finds me arriving home with staples like kale and impulse purchases like rhubarb, but I’m mentally exhausted by the time they reach the crisper. So it works much better for me that, once a week, someone decides for me which ripe and wonderful goodies will fill my bag. That way, I can giddily unload them into my refrigerator and think quietly, in the comfort of my home, of what I should do with them. This past week’s CSA delivery included more turnips, salad greens, snap peas, collard greens, scallions, and garlic scapes. 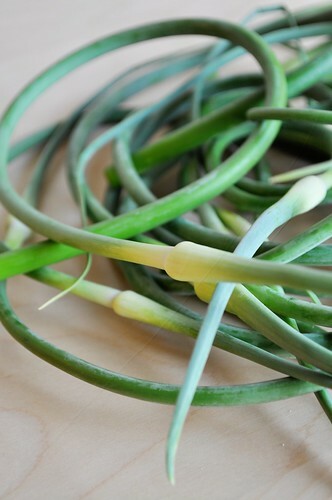 I was particularly–and I’m sure, understandably–excited about the garlic scapes. They’re one of those fleeting, coveted greenmarket grabs that I know I’d wind up missing or staring at longingly before deciding to be reasonable and grab the spinach instead. What to do with them, though? Pesto seemed the most obvious choice. Let me just say this before you whip up a batch of your own, make sure you and the intended recipients of your dish are garlic lovers–avid garlic lovers, passionate garlic lovers!–before you dole out any generous helpings of the stuff. We just happen to fall solidly in that category so we enjoyed it, but it was definitely, shockingly potent. Also, it would be wise, unless you intend to somehow cook the pesto (or have done some cooking of your scapes prior to pulverizing them), to eat this in moderation. Chris and I filled our bowls as we would on any other occasion on which we were starving for spaghetti and found out the hard way that eating large quantities of raw garlic can make you sick–as in nausea, stomach pain, et cetera sick. 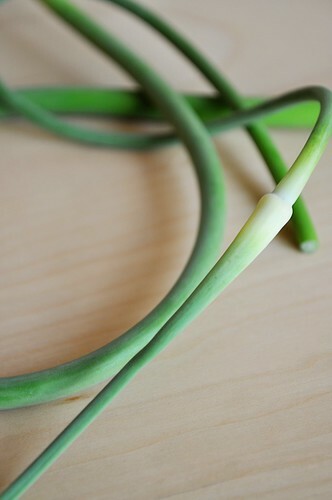 Please don’t let that deter you from working with garlic scapes or making them into a pesto, though–they really are a treat for anyone who adores the flavor of garlic. Our unreasonable portion sizes had us each downing nearly 1/2 cup of the pesto, which is really twice as much as anyone probably ever should. Despite the fact that we each spent the next day clutching our guts, I still have every intention of using up the leftovers–cooking the pesto into some tomato sauce, spreading it on gluten-free bread for garlic toast, mixing a small amount with chevre or ricotta for a tasty spread. There are a million things you can do with this potent, passing wonder. I realize this may have been a weak sell on these delightful springtime curlicues, but all it takes is a quick Google search on the things to find some truly rave reviews. In the end, my fiance and I were less victims of the scapes than we were our own gluttony (there’s a “scape goat” joke in there somewhere). It should say a lot as well that, if I’m fortunate enough to spy them at the market, I’d gladly grab up another bunch or two or three. I’d love to try them roasted in the oven or draped over the top of a pizza, and I wouldn’t mind stashing a few jars of that pesto in the freezer so we can enjoy that distinct garlicky punch in the months to come. 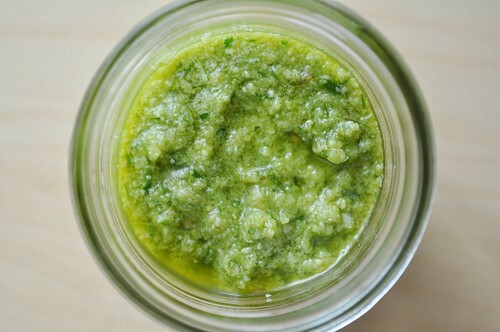 In my opinion, pesto is less of a recipe and more of a method. This is what I did, but adjust the ingredients as you see fit and according to what you have on hand. Don’t have pine nuts? Use almonds or walnuts or pistachios. Swap in some Pecorino Romano if that’s what you have in your fridge. You could also throw in some basil or other herbs for variety. Make it yours, but make it soon. These babies don’t hang around the markets for very long. 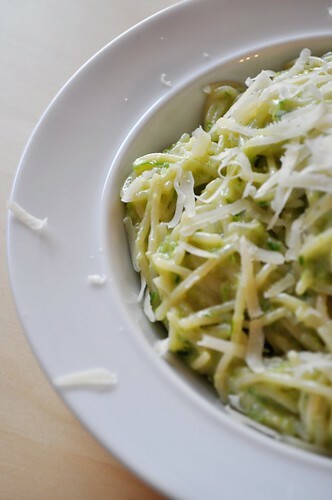 Add the garlic scapes, pine nuts, and Parmigiano Reggiano to a the bowl of a food processor. Pulse until everything is roughly combined. Add the salt. Turn on the processor and slowly stream in the olive oil until the pesto reaches your preferred consistency. The pesto will keep for a week in the refrigerator or up to a few months in the freezer.